Summary: The Dolphin Escape packs a whole lot of the latest features and tech into a lightweight, super-affordable pool cleaner. No remote or timer, but the price is right. Highly recommended for above-ground pools. 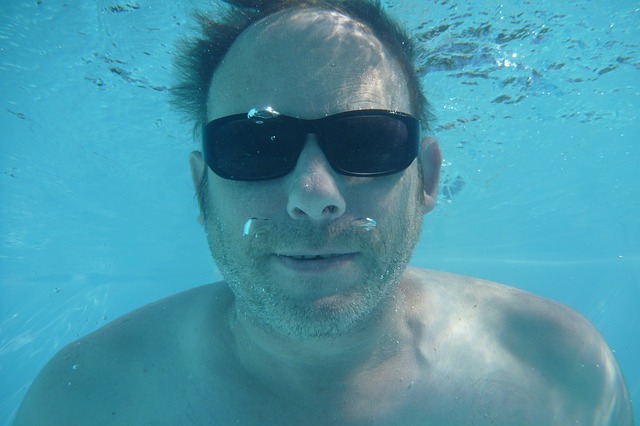 State-of-the-art in low-cost above ground pool cleaners today. 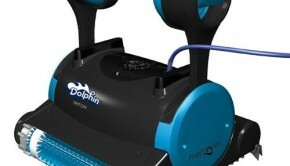 The NEW Dolphin Escape is one of the least expensive robotic pool cleaners made by Maytronics, the world’s leader in robotic pool cleaning technology. 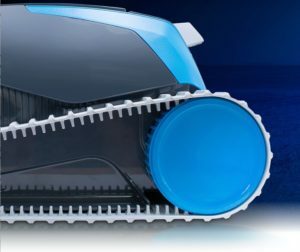 This unit is a simple, affordable robotic cleaner that features a ton of advanced features including HyperBrush scrubbing, advanced filtration, a smart scanning system and continuous rubber tracks that ensure the unit quickly and thoroughly cleans every inch of your in-ground pool. 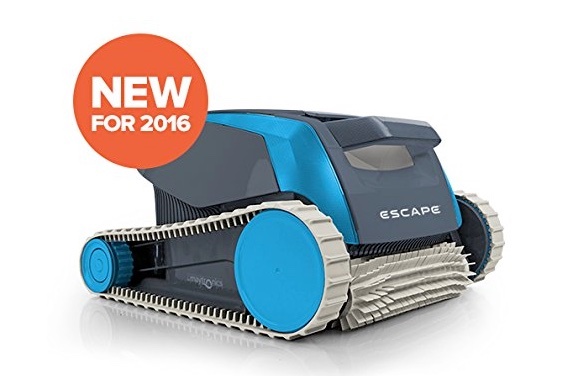 The Escape’s dual motors are also designed to be as efficient as possible, using much less energy than most other pool cleaners. 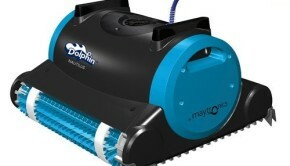 Overall, the Dolphin Escape represents the current state of the art in a low-cost above ground pool cleaner. 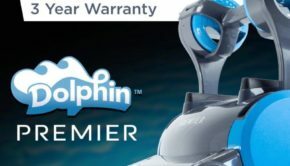 Note that the Dolphin Escape robotic pool cleaner is designed for use with above-ground pools only. To ensure it reaches every corner of the pool, it comes with a 40-foot long cable, which has no tangling problems. When you set the Escape down into your pool, it scans the entire surface using its built-in scanning and mapping system, SmartNav. As it moves, the scanner guides it to cover every part of the pool and avoids returning to areas that have already been cleaned. This makes for a faster, more thorough cleaning cycle verses other cleaners at this price, which tend to rely on random-walk for navigation. To ensure that no debris or dirt remains, the Dolphin Escape uses a rapidly-spinning brush they call, a HyperBrush. As the cleaner moves over the surface of the pool, the Hyperbrush system dislodges stuck-on particles, algae and bacteria from pool surfaces. From there, loose debris is passed through the cleaner’s advanced filtration system. The ultra-fine filters in this unit will catch everything from the tiniest of algae to large leaves and twigs, leaving your pool floor nice and clean. 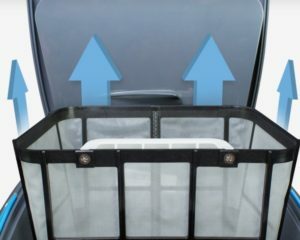 Filtered debris is then deposited in an oversized filter cartridge. With a larger-than-typical capacity, the Escape’s cartridge can handle more debris and allows the cleaner to run for longer without the need to empty it. 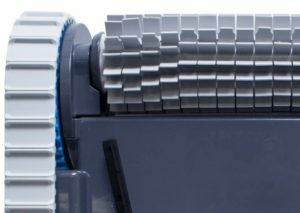 It is also important to note that the cleaning action of the Escape is bi-directional, which means it will keep on scrubbing and vacuuming whether it is moving forward or in reverse. This further improves efficiency and helps cut down on cleaning time. A quick review of customer reviews on Amazon and other retailers shows that most customers are extremely happy with the cleaning ability of this very affordable robot pool cleaner. 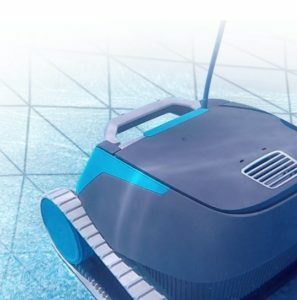 One of the biggest challenges every robotic pool cleaner faces is sticking close enough to the surface of a pool to clean it thoroughly – especially as it moves. Water tends to reduce traction, causing the unit to slip and slide. This leads to a lot of wasted energy, as the cleaner attempts to navigate the pool. Cleaning also suffers. To solve this problem, the Dolphin Escape is fitted with HyperGrip Continuous rubber tracks. By opting for a continuous track rather than wheels, the unit is better able to combat loss of traction when moving in water. Constant contact is maintained between the tracks and the surface, allowing the cleaner to move steadily – even when climbing walls. Track drives like this come in handy when the robotic cleaner has to move over obstacles and large pieces of debris. Sometimes, wheels will get stuck or jammed-up when encountering leaves and twigs, but tracks do not. Early robot pool cleaners (and some less expensive ones, today) used “random-walk” systems to traverse your pool. Basically, they randomly moved around your pool floor and relied on statistics to ensure a good cleaning. If run long enough, the chances were good they would cover every square inch. But random walking wastes a lot of time and energy. So, the engineers at Maytronics equipped the Escape with their popular SmartNav scanning and mapping system, which scans and maps your pool, memorizes its surfaces, and then navigates it intelligently without repeating a spot. SmartNav helps the Escape navigate your entire pool more efficiently, in less time – and without missing a spot. Additionally, the SmartNav system can sense the presence of obstacles like ladders, drains and steps and guide the robotic cleaner safely over or around them. This reduces the chance that the cleaner will get stuck. This is a great feature that is thankfully becoming common in newer, low-priced units like this one. 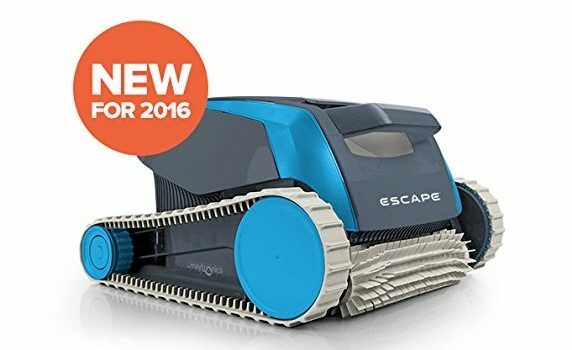 The Dolphin Escape comes with an extra-large filter cartridge that can handle more debris than most other robotic cleaners. And cleaning the filter is really easy. The robot has a top-access door through which you can easily lift out the cartridge and empty it. I greatly prefer top-loading filters over the bags that normally come with a cleaner in this price range. Extremely energy efficient, allowing pool owners to spend less on power bills while still keeping the pool clean. 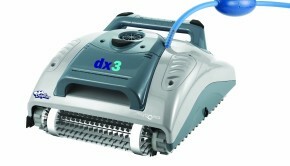 Really fast and thorough cleaning cycle thanks to its continuous tracks, SmartNav system and an ultra-fine filtration. Extra-large, easy to access filter cartridge. Extra-long 40-foot cable that truly has no tangling issues. No timer. This means you cannot set the hours of the day to clean. Typical for a cleaner in this price range, like the Aquabot Pool Rover. No scheduler. Also typical for a low-priced unit. You cannot set automatic cleaning times by day of week. This is a disadvantage if you want to clean your pool while you are out of the house. No remote control. Again, at this price I don’t know of any robot pool cleaners with remotes. The Dolphin Escape represents the state-of-the-art in a low-cost robotic pool cleaner for an above ground pool. It packs most of the latest advances in pool cleaning technology (that actually matter) into a very simple, reliable and compact package. The Escape does a remarkable good job cleaning almost any above-ground pool in less than 2 hours. No, you can’t program the timer or schedule it to run all week. And you don’t get a remote or a caddy. On the other hand, you do get most of the latest features that actually make a difference in cleaning a pool packed into your pool cleaner – and you do save $100s vs. similarly-equipped cleaners. In short, the Dolphin Escape does a remarkable job cleaning almost any pool in less than 2 hours – for a steal. Where can I buy the dolphin escape? It is not available on Amazon. What country are you visiting from? In US/Canada, the Dolphin Escape is available on Amazon.com. It is “Amazon’s Choice”, right now.